You don’t need to be an MIT grad to appreciate the intricacies of the man-made wonder that is the Panama Canal. I’ll spare you the Wiki-able details involved in each ship’s crossing. Suffice to say that what stood out the most, in my beer-aided opinion, was the simplicity and plain smoothness of the process. To do what they do, and make it look that routine, is truly amazing, and is well worth the visit if you find yourself in Panama City, even if just for a voluntary 23-hour layover like my own. But much to the dismay of my Dad and Granddad, I’m no engineer, so the inner workings of the Canal didn’t interest me that much. In fact, aside from my Formula 1 fandom, I’ve never even cared that much for cars. It’s one of my three man-flaws, along with hating to play golf and loathing fishing. I’m completely comfortable admitting it because it’s part of who I am. To say otherwise just to make more people like me or think I’m normal would be a betrayal to my identity and very non-10k-ish. Which brings us back to transitioning Panama City. Having given the Canal a once-over and destroyed the adjacent Miraflores buffet (highly recommended), I turned my attention to a different form of transportation I caught a glimpse of on the taxi ride from the airport: Panama City’s colorful fleet of city buses known as the Diablos Rojos. Not having a particular interest in cars, it’ll come as no surprise to you that I’ve long been a champion of public transportation. Guilt-free drinking and a pair of idle hands? I’m all-in on that action. But aside from going hands-free on a boozy weekend night, Panama City’s armada of converted school buses offers much more than your average public commute. Custom graffiti on every square centimeter? You better believe it. One-of-a-kind nicknames like El Diablo Rojo and El Venturoso? Brings me back to my Super Mario Kart days. Salsa pumping from the moment you pay your fare, which is all of 25 cents? Are you kidding me? Why are the Diablos Rojos just now entering my life? I set out to find the story behind these mobile discotecas Panamanians move around in, as they were the only thing I had discovered thus far about Panama City that set it apart from other seaside towns. At a glance, the city even looked like Miami at times. Wasn’t I in Central, freaking, America? To do my best journalist impersonation, I sought out a local cabbie to take me to the Canal in hopes of picking his brain throughout the ride. As an added bonus, I could give him a hard time about how great Panama’s soccer team is for a baseball country. Now, despite the public perception that Latin American taxis are a sure way to get kidnapped, taxistas are still one of the more reliable sources of local info in many Central and South American towns. If you can find one blaring a news program or futbol game on the radio, even better. Plus, if you do get kidnapped and live to tell the story, it’ll make you at least twice as interesting at happy hours and hostels. And it’ll help you get over that silly fear of being kidnapped for the first time. I hailed my particular taxista down near the hostel, and after busting his chops about his country’s shameless attempts to claim Panama Hats as their own (fact: they ARE made in my 2nd country, Ecuador), I asked about the infamous buses. The cabbie, a dead ringer for SNL’s Horatio Sanz in his fatter days, went on to tell me how the Diablos are outdated school buses originally brought over from the United States. 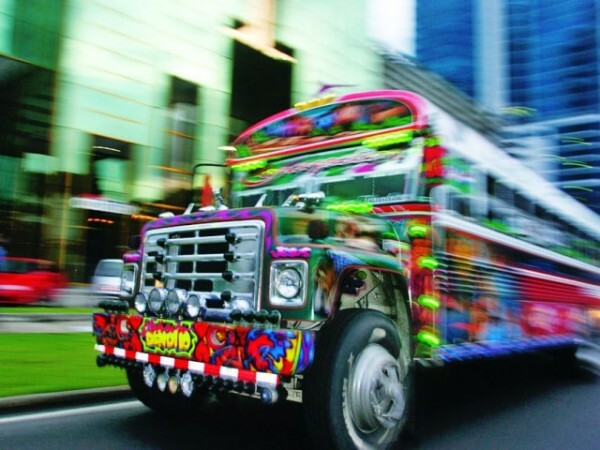 Used solely as inner-city transport, and independently owned and operated for decades (which is why each remains unique in design and decor), they’re a distinguishing part of Panama City’s public transportation system, albeit a notorious one. Yet despite their colorful nature and vibrant energy, he went on to tell me the pirate buses are in the process of being phased out and replaced by newer more modern models, with the last one scheduled to be decommissioned by the end of 2012. Did you like him more before or after he looked like every other Latin comedian? I rest my case. And there it was. The lone attribute that let me know I was in Panama City, without having to drive outside of town to a freaking canal, was being done away with. Swept under the rug like a mistress’ stray hairs. Inevitably forgotten by a city more concerned with modernizing itself to look just like every other touristy town around the world. Now I understood why Panama City popped up so often on mainstream travel columns. Why International Living had beaten it to death these last few years. Panama City was selling its soul to the Diablo, by getting rid of its own. It’s not that big of a surprise at this point. This happens all too often. Even so, it never fails to disappoint. What makes towns and cities travel destinations are the little differences and nuances. It’s these differences and nuances that drive interest and become the topic of endless blogs and articles. But once interest peaks, outside investment arrives with foreign concepts and the cookie cutting begins, destroying some, if not all, of the characteristics that brought people there to begin with. I’m not talking about pavement and hot water. Infrastructure has very real benefits to any city or town. It’s the Diablos Rojos of the world I’m concerned with. It’s the tuk-tuk yielding the right of way to a cow in rural India, and the live chicken under the farmer’s arm on the bus ride to Quito, and the suicidal motorcycle taxis maneuvering around baby elephants on crosswalks in downtown Bangkok. 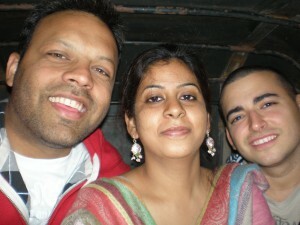 Enjoying a tuk-tuk ride with Nitesh and Co. in Ranchi. I don’t want the cookie cutter cookie. I want the hand-sculpted, chunky cookie that leaves a fat wad of gooey milk chocolate on your shirt when you bite into it too soon. I want cookies shaped like countries, volcanos, or snowflakes, with no two ever being alike. I want the type of cookie you could never package, because you’d have to make a new cookie tray for each unique batch. Most of all, I want something unique. Something I’ve never seen before. I travel for contrast, not comfort or interchangeable parts. Isn’t that the point? To send an all-out blitz on your senses in new surroundings while immersing yourself in a setting unlike your own? How could Panama City not realize that? I’m not undermining the benefits of new buses with air-conditioning, more comfortable seating, or more efficient transport either. Locals do complain about the run-down buses, from the reckless drivers to the loud exhausts. In other words, they’re no different from buses in most Central and South America towns. But, as one commenter pointed out here, a happy medium does exist where new buses could be introduced with the same decor and vibrance of the Diablos Rojos, thus upgrading the city’s transport while preserving some of its identity. Wouldn’t that be the best of both worlds? Apparently not. The government has no plans of this at the moment, so instead, we’ll have yet another homogeneous city on the water, with high-rise condos and a dozen McDonald’s sprinkled around a Wal-Mart. My buddy and I joke about getting to Machu Pichu before they build a Starbucks, but we say it only half-jokingly, as more and more travel spots are going pop these days. Even my favorite bohemian beach village, Montañita, is fighting off modernization. Where will it end? Why did Carlito let Benny live? A stripper and Miami. Why, Carlito? WHY?? 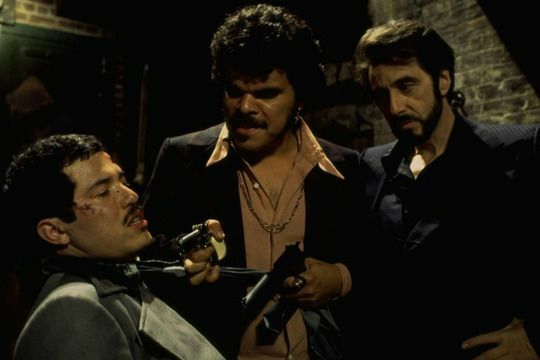 Always in search of a good movie analogy for any and all situations, I settled on “Carlito’s Way”, with Panama City playing Al Pacino’s role of Carlito Brigante. Carlito’s rise was due to his crime savvy and good judgment along the way. In trying to change his ways in the latter stage of his life, he admits going soft when he decides to let Benny Blanco live after their tussle in the nightclub. Deep down, he knew he was making the wrong logical choice, but he wanted to be something he wasn’t. For a moment, he lost sight of his identity, and in the end, it led to his demise by way of a fatal encounter with Blanco, just as he was making his getaway with the love of his life. And this is where we find Panama City now. Dreaming about being like someone they’re not, and forgetting what made them who they were. I’m no engineer. And I’m certainly no criminal mastermind. But I don’t need to be either of the two to know that some things should never be completely modernized, and with Panama City’s identity becoming less and less identifiable, the assorted cookie tray that is the fleet of Diablos Rojos certainly falls under that category. If I was an eccentric millionaire, I’d buy one of the local baseball teams, rename them ‘Los Diablos Rojos’, buy the last bus and make it the official mode of transportation for all away games. It’s a shame to hear when cities change like that – unfortunately economics usually dictate and I’ve found many developing countries are chasing the ‘American-dream,’ resulting in Wal-marts and fast-food chains. It is sad but I do understand why it happens. No excuse, though. I’m sure the locals will regret it.